I decided to give this extended battery a shot. I was skeptical of course, but I wanted to give you my initial impressions. Keep in mind that this is my first week with the battery. 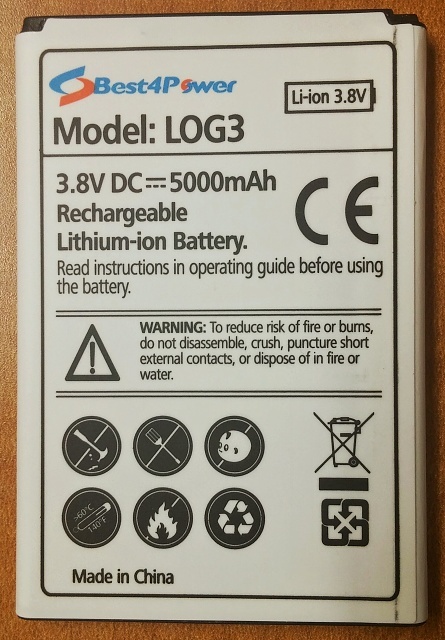 The battery itself states 5000mAh, but the ebay description shows 4500. It is the same size as the oem battery, but a little heavier. I ran it through the suggested power cycles by leaving on Netflix with the screen at 100% brightness. 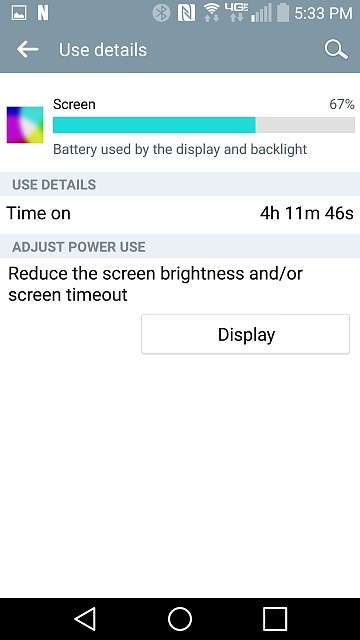 I am amazed that I got over 4 hours of screen on time with 100% brightness and 2% battery left for the past two power cycles! I am usually lucky to get anywhere near 3 hours of screen time at 40% brightness with the oem battery. Also, at no time when I checked the phone did it feel overly warm. With the oem battery, I have gotten warnings about the phone being too hot. The battery is $19.85 with free shipping, and after another week of trying it out on a regular basis, I will probably order another for a back up. I'll give more feedback on this forum after I use it more. Just wanted to pass this along for people looking for extended batteries. PS - I am rooted with stock and using Amplify and Greenify. donm527#IM, belodion and xocomaox like this. Ordered. Keep us updated on how it run. I've been looking for a extended battery OEM sized. For $20 worth giving it a try, Thanks. BTW, can anyone recommend a battery app that can get readings and give detail on battery installed? When I get mine would like to see if app will tell truely the mah as well as other battery info if possible and compare it to OEM. CPU-Z should do the trick. I would think. CPUz does not tell you the actual MAh of the battery. You would need a battery reader for this. 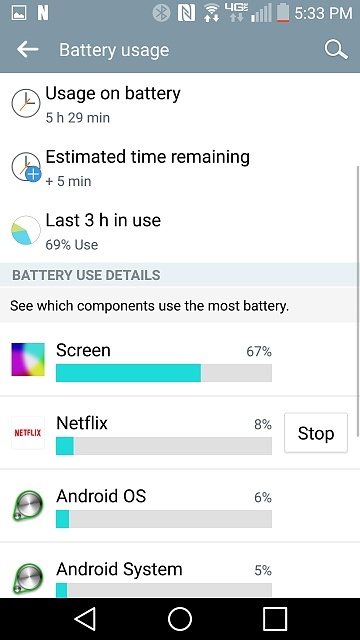 Could you show us Screen on Time under normal usage? Checking google play, it says Version 1.09 update they added Battery capacity (in mAh). So this is a bigger battery that fits in the standard space without making the phone bulkier? All that does is read what you phone is supposed to have so it will say 3000 regardless of how large your battery is. This is not an actual reading. From what I understand, yes. I want to purchase one but still would like to see normal usage screen-on-time. Nobody runs at 100% all the time unless they are in direct sunlight. Give me a couple of days to see how it does under normal usage, and I'll let you know. Also, just to see how it compared, I ran the oem battery at 100% brightness on Netflex and got about 45 minutes less of screen time than the replacement battery. I did notice the phone ran hotter with the oem battery. I've found with my 3rd party 6,000MAh battery it runs a lot cooler as well. How it performs with auto-brightness?? Whats the SOT?? I purchased a battery similar/same as described (4xxxx) some 7 months ago. I believe in carrying a spare. I haven't noticed a difference between the original or my newer one. Aside from label's I cannot see a difference. That said, the G3, as far a my personal experience is concerned, gets great battery life. 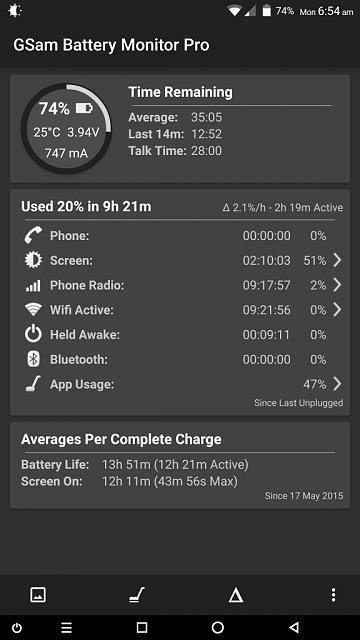 In this competitive world battery life is measured and compared. I am sure if a knock-off battery, the same size, got much longer up-time, LG would use it. That doesn't make the knock-off bad, just don't expect miracles. Any new updates on how the battery is working? My Hyperion 6000mAh with TPU case is rocking for me since the L update. I would be interested in a stock size hi-cap battery though, FWIW. 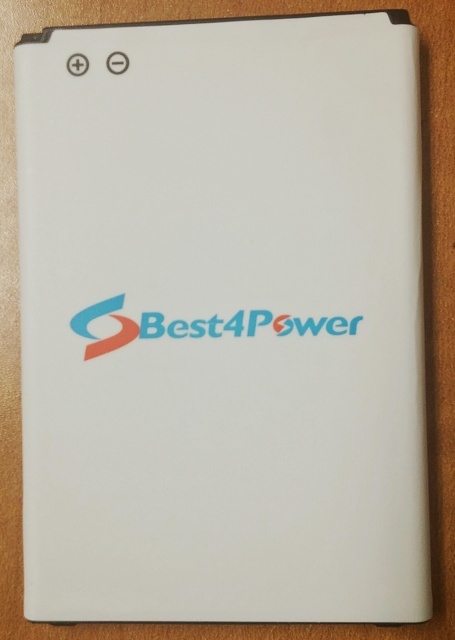 So far, I would say that I get about 1-1.5 more hours out of the Best4Power battery than oem, but nothing remarkable. Keep in mind I've only been using it on a regular basis for about 3 days now. I usually leave my phone on the charger at work, so I am trying to remind myself to not charge it during the day to see how the battery does. Just got mine in the mail. Gonna follow the instructions on ebay and drain and charge and see how it performs tomorrow under regular use. $20 for a replacement battery that's cheaper than getting an extra OEM and get 1-1.5 hour more screen?? I don't see myself needing or wanting to swap batteries but now I'll have my original OEM as a spare if needed. I've also used the Anker 3000 mAh battery, which I feel gives comparable performance to the oem battery. You can also buy a two-pack with a charger. The charge is pretty slow, but it can come in handy if you need it. How thick is the phone with this battery? I would want something that still fits easily into my pants pocket. 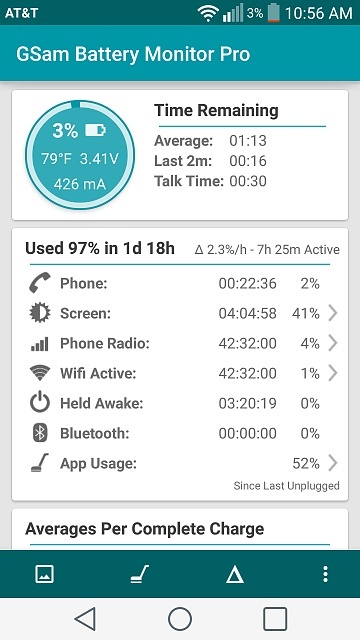 I have had this battery for about a month and a half. It adds no bulk to the phone. However I haven't really noticed much improvement in battery life than the stock battery. I certainly have not experienced one and a half battery life like the math would tell you I should be receiving. Having said that it is not bad for the price if you want a back up battery. but when putting in the new battery the website says to use up whatever charge in the battery at initial install and then do a full charge, I still had 60% left and with brightness bumped up to 95% from my normal 70%, it took me about 2 hours of you tube, 30 minutes of recorded video from my gallery, about 10 minutes of streaming video from my cnbc app and 30 minutes of navaigation to work to drain it. With the OEM battery on a regular day use I don't get much more than 3 hours screen time before battery gets low. So to get 3 hours from 60% I find impressive for me. Fully charged in less than 2 hours and using it now it's drained 10% in 90 minutes pretty fast and will see how battery does after I've drained the battery a few times and should be conditioned. Definitely sounds like you are getting better battery life than me. Could be differences in the batteries themselves I guess. I did all the conditioning recommended and didn't notice much change. To be fair I do believe this battery to have slightly better battery life than the stock one. Just not the jump I was expecting. Still going through the process of conditioning the Best4Power battery I got from Ebay, draining it 3-5 times but this is my 2nd or 3rd full charge. I always keep it at 70% brightness. I feel it's a solid battery for the price... doesn't drain fast when not in use which is just as important than on screen for me. And in mix use, off and on, I am happy getting at least 3 hours screen time with the total available time like the 42 hours of total time shown below. If I just wanted to test screen time going 100% to 0 immediately, I could stream youtube or CNBC live from full charge and get another hour of screen time easy. 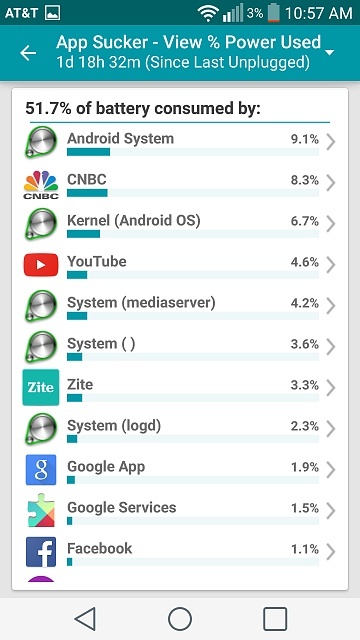 So it's no better than stock battery from LG? That's what I am getting from your post. It's been out for over a month, do you miss the Removable Battery and/or Expendable Storage?